Can Colorado’s complete victory over Chicago get Rockies back on track? The Colorado Rockies have been a bit of a mess to start out the 2018 MLB season. They just posted the lowest team batting average in a single month in their franchise history throughout March and April (.222) and currently have more strikeouts than hits through 31 games. The Rockies are sitting one game above .500 at 16-15, but there are a lot of issues with this ball club. Thankfully, Colorado’s win over the Chicago Cubs was a showcase of the damage that this Rockies team can do even if they are not at their best. They were able to hit the ball over the fence and get strong starting pitching before turning the baseball over to the Rockies dominant bullpen staff. Of course, it was Wrigley Field in Chicago where baseballs leave the atmosphere in a hurry, but seeing the Rockies get home run production from other players other than named Charlie Blackmon was a welcomed sight. This Rockies ball club is at its best when they have the addition of power to their lineup and they used that power starting from the very first batter of the game. Blackmon drove the seventh pitch of the game into center field to get the Rockies out to exactly the start they wanted — a lead with their young ace set to take the mound. Then it was David Dahl’s turn tally his first dinger of the 2018 season when he took a hanging curveball on the outside of the plate to left-center for back-to-back long balls out of the gate. Seeing the aggression and influx of power immediately to start the month of May is a great sign for the Rockies. Later in the fourth inning, Nolan Arenado led off and took another one of Kyle Hendrick’s pitches outside of the field of play. The Rockies finished with just four hits, but three of those hits left the yard to give the Rockies a 3-1 victory over the Cubs. It may not have been pretty, but the infusion of power and aggressive demeanor at the plate from Colorado is what gave them enough to get the victory. Colorado’s bullpen needed help and Jon Gray needed a strong start under his belt in which he was able to go through the opponents batting order for the third time and come away victorious. Gray has posted an ERA of 4.99 in seven games this season an has just pitched 39.2 innings so far, meaning that right around the middle of the fifth inning is usually when the wheels start to fall off — right around when the batting order flips for the third time. There has always been a frustration surrounding this thought process and Gray. On one hand, he can look like one of the more dominant young starting pitchers in all of baseball for the first three or four innings, but the consistency never sticks. Instead, Gray gets attack more relentlessly the longer his start becomes. Because of that, Gray has to find a way to diversify his pitching style to throw batters off balance. Against the Cubs, that is exactly what happened. Gray finished seven strong innings in which he only allowed three hits and one walk while striking out six Chicago batters. The Cubs were only able to muster a single run off of a solo home run from Anthony Rizzo. Beyond that, it was nearly an impeccable outing for Gray, who needed a start of that caliber to get himself back on track. 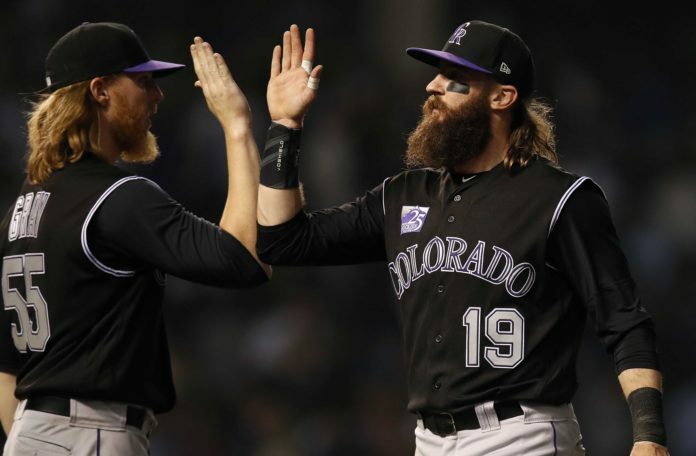 Once Gary handed the ball off to Bud Black after a phenomenal start, it was time for the expensive and productive Rockies’ bullpen to take over and slam the door shut on the Cubs in Wrigley Field. First up was Adam Ottavino as he continued his torrid start to the 2018 season. The minutia of movement and rotation on the baseball was being perfectly manipulated by Ottavino, who was surgical with his precision, yet devastating with the movement on his pitches. Just look at the filthiness and how un-hittable this slider is that he threw in the eighth inning last night. Then, after having to deal with Ottavino’s ability to bend time and space with a baseball in his hands, the Cubs had to contend with the Rockies newly minted closer Wade Davis as he came in to do what he did 32 times last season — close out a game involving the Cubs. This time though, it was Davis up against his former Cubs ball club, but the result was the same. Davis closed out the game with two strikeouts and a walk without giving up a hit as the Rockies came away with their 16th win. When the Rockies offensive power gives their young ace a lead to work with before Gray even steps foot on the mound, that is ideal. When Gray goes seven innings and keeps the lead throughout the game before passing the ball to the bullpen, that is ideal. When the Rockies can unleash the likes of Ottavino and Davis in the final two innings of the game in conjunction with everything else, it is hard to script a better recipe for success for the Rockies.